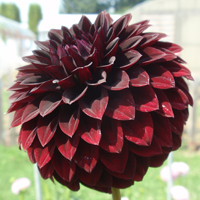 Information presented in the Bulletin, an American Dahlia Society (ADS) quarterly publication, and on this web site is published for the information of the members of the ADS and other readers. The ADS does not certify the accuracy of information in articles accepted for publication or posting. Recommendations and representations are solely those of the individual authors. Publication does not reflect an endorsement by the ADS. As a matter of policy the ADS does not recommend or endorse the use of specific chemicals or other substances in connection with the cultivation of dahlias, and nothing in the Bulletin, web site, or any other ADS publication is intended to be inconsistent with this policy. Under no circumstances, shall the ADS be liable for any actions taken or omissions made from reliance on any information contained in the Bulletin or the ADS web site from whatever source, nor shall the ADS be liable for any other consequences from any such reliance.